The VSS3-reverb technology inherent in the TC Electronic M3000 is an industry standard. The TC Electronic M3000 has some of the best sounding, most versatile and easy-to-use professional reverbs for music and film/post applications. Combining ultimate control of directivity in the early reflections with a transparent and harmonically magnificent diffused field, the art of reverberation is brought to a new and higher level. The TC Electronic M3000 enables you to add the softest and cleanest ambience to your work that you have ever heard. Furthermore the processor boasts a wide range of tools and presets to give you the exact vintage or post production reverb you are looking for. With Dual-engine structure enabling two simultaneous reverbs or effects, award winning intuitive user-interface, 600 factory presets and multiple I/O formats, the TC Electronic M3000 is one of the best reverb choices for high-end music- and film/post-production. The TC Electronic M3000 is a dual-engine reverb-unit, where both software algorithms and hardware performance is optimized to the highest level. This leaves you with a box that is a no compromise solution solving all your reverb requirements – and in the easiest way thinkable. 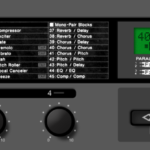 In addition to all the reverb algorithms TC Electronic M3000 contains various processing effects and tools that can be used stand alone or in conjunction with the reverb programs. e.g. combine a de-esser or a chorus with a reverb and get a completely new sound. TC Electronic M3000 holds one of the most versatile sets of application specific factory presets on the reverb-market. 250 Single Engine plus 50 Combined dedicated Music production presets, and 250 Single Engine plus 50 Combined Film&Post-production presets, gives you a total of 600 factory presets to choose from. All of the presets are made by industry professionals and they are ready to use out of the box. Using the TC Electronic M3000 presets is easy: Select a preset, adjust Decay, Predelay and perhaps the Hi-color and you have the desired reverb sound.